Our student-teacher ratio is 4:1. 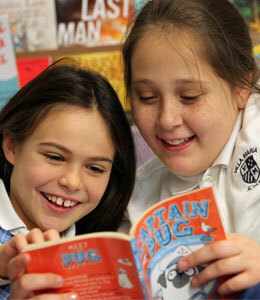 We are a coed school for students in kindergarten through ninth grade. All teachers are state-certified in special education. Twenty-three are full-time teachers and one is a part-time teacher. In addition to academic faculty, our staff includes social emotional, speech & language, and occupational therapists. Overall, 74% of our staff hold, or are working toward, advanced degrees. Reading teachers are trained in and use multisensory strategies to develop reading skills. Programs used may be the Lindamood-Bell reading program, including the Lindamood Phoneme Sequencing Program for decoding and the Visualizing and Verbalizing for Comprehension, the Preventing Academic Failure Program, or the SPIRE Program. Students in upper grades who have mastered decoding skills use a variety of reading materials, including class novels and anthologies, and continue to work on vocabulary and syllabication. Language Arts teachers are trained in Basic Writing Skills, Story Grammar Marker, and Theme Maker. Teachers employ strategies of the Basic Writing Program, including sentence expansion and basic outlines. Handwriting instruction is based on Handwriting Without Tears and The Loops and Other Groups programs recommended by leading occupational therapists today. Teachers employ multisensory strategies, using manipulatives, so students may move from the concrete to conceptual understanding. They may utilize the strategies of the Lindamood-Bell On Cloud Nine math program. Lower grade students gain automaticity of math facts using Math-a-Magician, flashcards and repetition. Science education focusses on the major themes of Physical Sciences, including biology, physics, chemistry, geology, and environmental sciences. Students work both indoors at the science lab tables, as well as outside, to explore the science of the world around them. Field trips include visits to iFly indoor skydiving to explore themes of velocity and motion, ropes courses to explore themes of physics and simple machines, and Nature’s Classroom to explore themes of flora and fauna. Our students study the five themes of social studies, including history, geography, government, economics, and culture, as we examine our local, regional, and global neighbors, and our place among these neighbors. Students examine primary and secondary source documents intended to help them become critical thinkers. Our faculty and students employ technology to enhance the teaching and learning experience. Smartboards, iPads, and personal computers all provide students with access to information, software, and digital tools to individualize instruction and empower students to improve their academic performance. Students engage in visual arts (painting, drawing, collage, and ceramics), along with music and theater as they engage in a wide and robust program of visual and performing arts. Interscholastic, intramural, and physical education opportunities abound at Villa Maria School, including cross-country, basketball, yoga, cross-fit, and more. About 24% of our students receive some form of financial assistance.